This is Part 1 - Scripts, textures and sounds for a breedable pet Troubot Robot in Second Life. All of the scripts and sound file for this project are located at my library area in a zip file. These files are covered by the license agreement. There are multiple project files located in the zip. After you extract them. 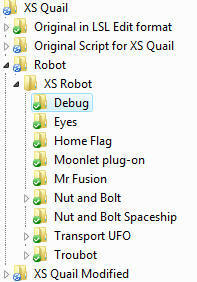 you must navigate to the "\XS Pet Robot\XS Robot" folder. I strongly suggest you make this Troubot Robot as a training exercise before you start to hack and slash at the scripts. There are some rules and sequences that are important in this project. You must have all the pieces completed and then assemble them, in order. Instructions to make changes are found in Part 7 - Modifying your Troubot Robot.